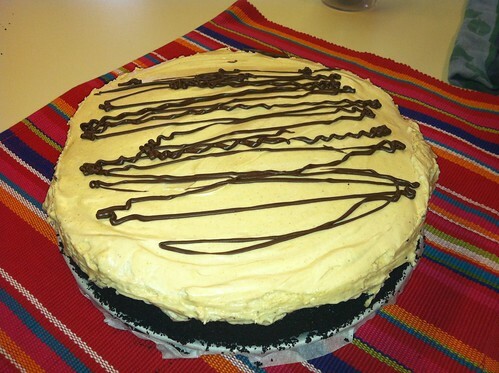 Yesterday all over the blogosphere families made Peanut Butter Pie. It was the recipe of the day on FoodNetwork.com. CNN picked up the story. Why oh why was Peanut Butter Pie such a big story? It is and was a gesture of love. It's that simple. Jennifer Perillo is a food writer and blogger. Last week Jennifer's husband Mikey collapsed and died from a massive heart attack, leaving her without the love of her life and father of her two young children. In a week filled with pain, she reached out on her website, In Jennie's Kitchen. So many people had asked what they could do. She simply asked asked that on Friday, when they would be having a service to honor Mikey, "make a peanut butter pie this Friday and share it with someone you love. Then hug them like there's no tomorrow because today is the only guarantee we can count on." I made the peanut butter cream pie last night and today will enjoy it with my family. I can guarantee there will be hugs.